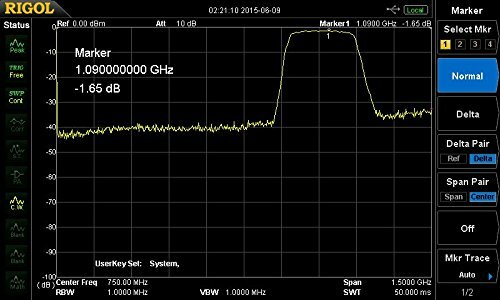 FlightAware.com have released a new 1090 MHz bandpass filter that is intended for use with the RTL-SDR. FlightAware.com is a website that aggregates ADS-B aircraft location data from various contributors. The contributors are often users with RTL-SDR dongles running their PiAware software. By contributing to their service you gain access to their premium services for free. The bandpass filter is available on Amazon for US customers for $19.95 USD and on eBay worldwide for $24.95 USD. This is the cheapest ADS-B filter we’ve seen yet. It comes in a metal case with SMA connectors, passes 980 MHz – 1150 MHz, has an insertion loss of about 1.65 dB at 1090 MHz and has about a 40dB drop outside the pass band. Over on their forums many users are reporting good results. A bandpass filter blocks all frequencies apart from the range you are interested in, significantly reducing the effects of out of band interference. It is especially useful if you live near cell phone towers as these can easily interfere with the 1090 MHz frequency. FlightAware also sell an ADS-B antenna on Amazon for $44.95 USD and worldwide on eBay for $54.99 which may be of interest to some people. An alternative ADS-B filter for the RTL-SDR is the one made by Adam 9A4QV. Adams filter uses LTCC filter technology which gives lower insertion loss, but a less sharp cutoff. The 1090 mHz. band is not part of the designation for mode ‘S’. but is actually lower than mode ‘L’, which is 23 cm. 1090MHz is the Mode S reply from a 1030MHz Mode S interrogation.